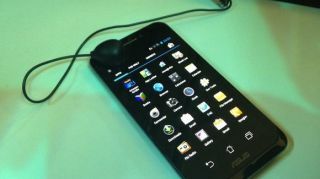 Asus will officially unveil the Padfone 2 Oct. 16, however information on the three-in-one device is already slowly beginning to trickle out. The most recent leak comes from Italian website eeepc.it. The site got ahold of specs for the Padfone 2 thanks to information picked up from the Japanese government's wireless device oversight agency for a product with that name. According to the leak, the Padfone 2's packing a 1.5GHz quad-core Qualcomm processor, which duplicates the chip specs found inside the original Padfone. However, this time around the smartphone/tablet/notebook might run a Snapdragon S4 Pro version, according to a report on Digital Trends. The Padfone 2, which uses the smartphone component to power the other devices it becomes, will host 2GB of RAM, a 13MP camera and a 2,140mAh battery. The last detail is based off an eBay listing for an Asus A68 battery pack, and although A68 is reportedly the model number for the Padfone 2, the battery's validity is still questionable. As for the display, it looks as if this time around Asus is endowing the smartphone component with a 4.7-inch, 1280 x 720 resolution display, bumping up the original's dimensions of 4.3 inches and 540 x 960. There's also word of cellular data at GSM 1900/850 MHz and WCDMA 2100 MHz, while it'll also support Wi-Fi, Bluetooth and NFC. We won't know for a few weeks just what Asus is going to throw at us (the original Padfone was enough of a curveball), but TechRadar will bring all the latest out of the company's simultaneous Milan/Taipei event to light.